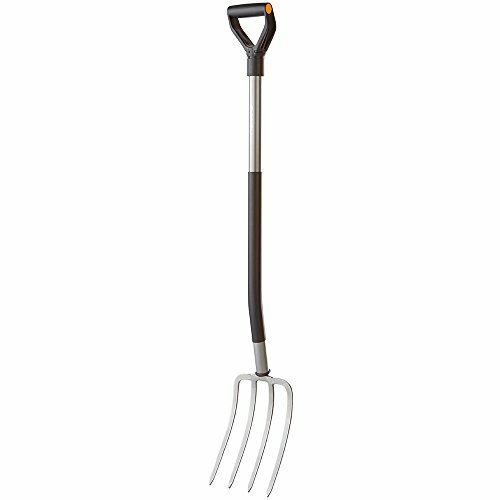 After a thorough look at compost pitchforks currently available on the market, we have found that the best one is the Spear & Jackson 4552BF Border Fork. While this fork is a border fork and not strictly a compost fork, it is the best compost fork for most non-commercial composters. The 4552BF is lightweight, rustproof, weatherproof, and water-resistant. This means even individuals who manage large compost piles will be able to turn over some old leaves with ease. The Spear & Jackson has a great handle and a comfortable length for most users. 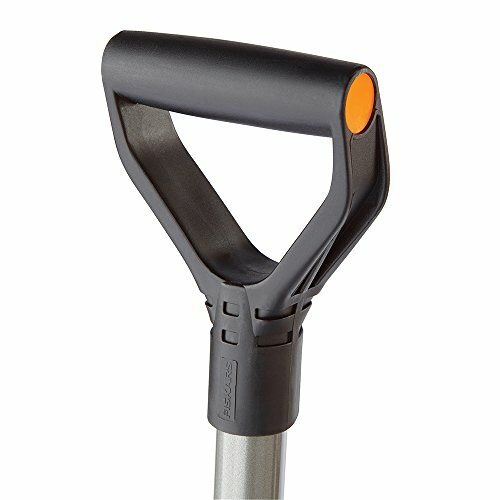 The short shaft is nice for those working with compost bins, and the lightweight but sturdy design is ideal for compost use. For more information on the Spear & Jackson 4552BF, see the Product Reviews section below. If you’re looking for a manure fork, the TABOR TOOLS J59A Steel Shaft Digging Fork is an excellent choice. Again, not strictly a manure fork, but this fork has many features that make it an ideal manure fork. It’s relatively inexpensive but is well made and quite resistant to wear and tear caused by moisture on metal. The durability is great, and it is covered under a lifetime warranty! Users should keep in mind this is a fairly heavy fork, and you may tire yourself out using it. For details on the TABOR TOOLS J59A, see the Product Reviews below. Not everyone can afford those big, brand name pitchforks, and that’s alright. For the individual who composts as a hobby or would simply like to save some money, there is the Truper 30314 Tru Pro 54-Inch Manure Fork. This particular pitchfork works well for both compost and manure. It is tough, suitable for all kinds of use, and is made from a single piece of fire-forged steel. This means little chance of breakage. The Truper 30314 is pretty lightweight, and comfortable to use with compost or manure work. Just keep in mind that there’s no handle, so you’ll be holding the shaft of the fork. For a complete review of the Truper 30314, see the Product Reviews below. We’ve put together a detailed explainer on the different types of pitchforks if you need to get oriented in terms of style of fork. But the bottom line is that there are so many variations between forks, and so much overlap between them, that the standard classifications of different forks have blurred quite a bit. Here are a few aspects to keep in mind when shopping for a manure or compost fork. The weight of the fork is an important consideration when it comes to compost and manure. These materials can get pretty heavy, so if you have a heavy fork, you’ll only be adding to the weight, and to your exhaustion. A light weight fork is a plus when working with these materials. Classically, manure and compost forks tended to have 5-6 tines of a thin design. This setup is helpful, though working with a 4-tine fork is generally pretty acceptable when it comes to manure and compost. When dealing with compost, you typically want tines that are fairly thin, as opposed to thick tines. You’re less likely to get the compost stuck on the tines when they are thin, so you’ll spend more time moving and turning compost, and less time cleaning your fork. Depending on the environment you’re working in, a long shaft can make maneuvering a challenge. Shorter shafts are great for those who are on the short side, as well as for those who are working in enclosed areas like compost bins and heaps. If you have loads of room around your heap, then there’s no problem with a long shaft. But if you have a compost bin that is a contained area without a whole lot of space, working with a shorter-shafted pitchfork will make life easier. In this section, we’ll look at five of our favorite compost and manure pitchforks. We’ll present all the options in a comparison table for quick reference and then move into individual reviews. We’ll conclude with our favorites. Product Dimensions: 37.6 x 5.7 x 3.4 in. The Spear & Jackson 4552BF Traditional Stainless Steel Border Fork (Spear & Jackson 4552BF) is a pitchfork designed for compost and other basic materials that need to be shuffled and moved around. As is important for anyone working with compost, the pitchfork is easy to clean and resists the adhesion of soil and other materials. It features four tines that are polished to an almost mirror finish. These tines are rust resistant and made of stainless steel for better grip and durability. The Spear & Jackson 4552BF possesses a wishbone handle, which means it is made from a single piece of wood with a split about a third of the way from the top to form the handle. There is no metal or plastic grip for the handle. This handle is weatherproofed to better withstand working conditions and would not be damaged by wet compost. The entire product is durable and is covered under a 12-month warranty. The product dimensions are 37.6 x 5.7 x 3.4 in. and it weighs 3.3 lbs. This makes it lightweight and easy to use for people with large compost piles. The Spear & Jackson 4552BF Border Fork comes in first place in this review for several reasons, but one of the most important is the lack of surprises. The Spear & Jackson 4552BF Border Fork met all expectations and was exactly what it was supposed to be. The handle and head are durable, the pitchfork tines work well with compost, and a warranty is solid. The entire product is also lightweight, making it easy to wield for people of all experience levels, and the pitchfork even costs less than many other competitors of similar and even lesser quality. For all of these reasons, the Spear & Jackson 4552bF is the best pitchfork for compost. Product Dimensions: 8 x 1.2 x 40 in. The TABOR TOOLS J59A Steel Shaft Digging Fork is as capital as its manufacturer’s name. 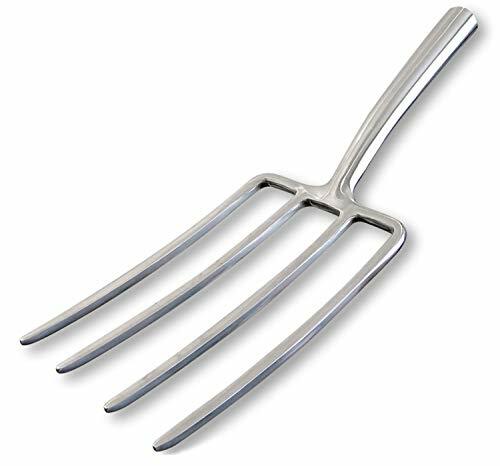 This particular pitchfork features four tines with blunt edges, a high carbon steel head, and a welded steel shaft. It has an ergonomic D-handle grip and includes a lifetime guarantee with each purchase, meaning individuals will receive a quality product and potential replacements and repairs from the manufacturer. The pitchfork is black, tough, and durable. The TABOR TOOLS J59A Steel Shaft Digging Fork features an anti-corrosive finish to prevent damage from coming into contact with damaging materials. The pitchfork is additionally rustproof and weather-resistant, meaning damp compost should not harm the metal. Just be aware that this product is on the heavier side, weighing 5.35 lbs. Additionally, it has a fairly long shaft at 40 in, which may make it a challenge to use in tight quarters like a Redmon Compost bin. After careful consideration, the TABOR TOOLS J59A Steel Shaft Digging Fork comes in second place just behind the Spear & Jackson 4552BF Border Fork. This pitchfork is strong, durable, and reliable. It’s additional layers of protection through rust and weatherproofing means it is ideal for compost and the handle is easy to grasp. The only reason this high-quality product comes in second place is that it is quite heavy, meaning some individuals will tire out fast when trying to use it. However, for those interested in such a powerful pitchfork, it can be had for a reasonable price and a wonderful lifetime guarantee. Product Dimensions: 6.5 x 9 x 65.2 in. The Truper 30314 Tru Pro 54-Inch Manure Fork (Truper 30314 Manure Fork) is a reliable pitchfork that works well for compost because of its durability, ability to grip a variety of substances and materials, and easiness to grip and hold. The full product dimensions are 6.5 x 9 x 65.2 in. and weighs 3.75 lbs., making it easy to wield by most adults. The pitchfork has five tines, a white ash handle, and a fire-forged metal head made entirely in one piece to prevent structural weaknesses. It has a long shaft, which makes it a good choice for use in areas with plenty of room to move and swing, and for use by larger individuals. The Truper 30314 Manure Fork has no specific grip, which means it can be held anywhere along the shaft. The manufacturer says the pitchfork is suitable for residential, commercial, and industrial use. The head is sealed, meaning it should be water and rust resistant. The Truper 30314 Manure Fork is good for composting but can be a little difficult to grip since there is no specific place to hold on the implement. The head is sealed and made in one solid piece, making it strong and durable. This pitchfork lacks structural weakness and is inexpensive compared to other models without sacrificing strength or comfort, which is why the Truper 30314 is our budget pick. Product Dimensions: 4.8 x 7.5 x 47.5 in. Fiskars is one of our favorite brands, and typically their garden tools rank toward the top of any list! However, while the Fiskars Ergo D-Handle Steel Garden Fork is quite good, it isn’t a top choice for compost or manure use. The Fiskars Garden Fork is one of the more expensive products on this list, but also one of the most comfortable to hold. The pitchfork features a standard D-handle design on the black plastic handle, though the plastic design is a potential failure and breakage point. It comes with four medium-thickness tines on the head. Both the head and shaft are made from welded boron steel and have been given a smooth finish. Overall, this pitchfork is durable and grips compost well, although there is some sliding when trying to handle papery products. A full lifetime warranty is included with every purchase of a Fiskars Ergo D-Handle Steel Garden Fork. The pitchfork weighs roughly 4.7 lbs and has a length of 47″. It should be noted that the ends of the tines are extremely square and not pointed. The Fiskars Ergo D-Handle Steel Garden Fork is a reasonable pitchfork for compost, but does come with some issues. The squared tines are dull and not the best at gripping materials. Many compost aficionados found they needed to sharpen them to grab slippery materials and papery products, two of the most common categories of compost objects. 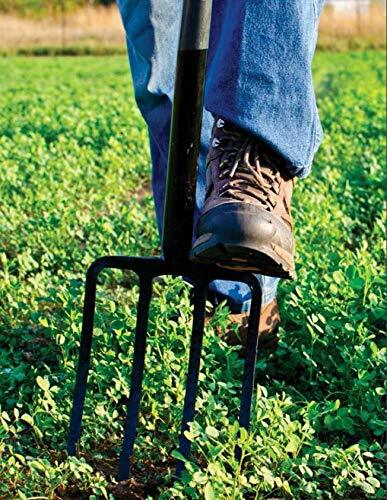 While the handle is comfortable to hold, this pitchfork is quite expensive and gives no indication of being rustproof, weatherproof, or water-resistant, important qualities in an all-purpose compost pitchfork. For these reasons, the Fiskars Ergo D-Handle Steel Garden Fork loses out to the Spear & Jackson 4552BF Border Fork and others. Product Dimensions: 6.6 x 9.4 x 60.2 in. 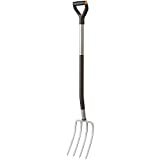 The Ames Companies, Inc. 2812300 True Temper Manure Fork (The Ames Companies, Inc. 2812300) is a high-quality pitchfork for regular yard work and composting. It comes in two different designs, one with five tines and one with six. The pitchfork is yellow and gray and possesses an oval steel head as well as cushioned grip for an easy hold. The shaft is made of hardwood but possesses no handle or other location to rest the hands, meaning individuals need to grasp the shaft. The Ames Companies, Inc. 2812300 is durable, though it is only covered under a 90-day warranty. Better than nothing, but not a great signal from the company. This pitchfork weighs around 4.3 lbs. and has a total length of 60.2 in. 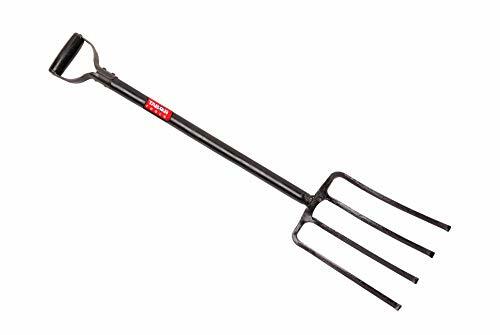 The head of the pitchfork is rustproof, meaning it is safe to use in damp or wet compost piles. The Ames Companies, Inc. 2812300 is inexpensive and it shows. Although a good pitchfork and reasonable for composting, the shaft is not finished and can leave splinters behind in individuals’ skin, which is never pleasant. The product is also not weatherproofed or water-resistant, which means moisture from the compost can affect the pitchfork. While the price is low and reasonable, there are other pitchforks at a similar price point of better quality. For this reason, the Ames Companies, Inc. 2812300 is beat out of the Budget Pick slot by the Truper 30314 Tru Pro 54-Inch Manure Fork. Product Dimensions: 42.9 x 7.5 x 3.5 in. The Radius Garden 20311 PRO Ergonomic Stainless Steel Digging Fork (Radius Garden 20311 Ergonomic Digging Fork) is a pitchfork that works well for compost. The full length is 42″ and the total weight is 4.8 lbs. It is made from stainless steel and the shaft itself is also stainless steel, although coated with resin. The handle is plastic and features the company’s patented ergonomic O-handle grip. The pitchfork is available in red, green, and blue. All are accented with black. At first glance, the Radius Garden 20311 Ergonomic Digging Fork is an excellent choice for many uses (it is our favorite Heavy Duty Garden Fork), but it’s not our favorite compost or manure fork. The tine design isn’t ideal for compost or manure work, and the weight is not insignificant, given the size of the fork. This pitchfork also does not offer some basic qualities present in other products around the same price, including rust resistance, minimal soil adhesion, and waterproofing. For these reasons, the Radius Garden 20311 Ergonomic Digging Fork loses out to products like the Spear & Jackson 4552BF Border Fork. Compost bins like the Soil Saver and compost heaps needs to be turned and adjusted to decompose correctly and ensure nutrients reach the soil. Manure needs to be worked and added to the soil maximum plant growth. To accomplish these projects, gardeners needs a reliable compost and manure pitchfork. Out of the products reviewed on this list, the best one is the Spear & Jackson 4552BF Border Fork while a close second is the TABOR TOOLS J59A Steel Shaft Digging Fork. For people on a budget, there is the Truper 30314 Manure Fork. Don’t let the simplicity of pitchforks be deceiving. It’s easy to end up with an inferior but expensive product, which is why this review was created. Once a pitchfork is selected, though, enjoy saving the environment, providing essential nutrients to the lawn, and irritating neighbors with that compost!